Elegant Kerala traditional Gopi necklace with ruby stones. This one gram gold traditional jewellery design flaunts the rich and dynamic jewellery culture of Kerala. It has an adjustable back chain. Any women with Sarees or ethnic wear it will add a classic touch on marriage functions. This necklace also worn by Brides and classical Dancers. One gram Gold plated Ruby Emarald fixed capsule model chain with Zircon stone fixed Laxmi Pendant and single pearl hanging. This ethnik necklace will give a traditional as well as trendy look to the bride. Wear it on festive occasions with ethnik wears or saree. This traditional Palakka Necklace is Simple and ethnic South Indian, Kerala Jewellery. This Jewelry has been arranged beautifully with Palakka and stones. Small round Pendant have golden bead hangings. Length can be adjusted with back link chain. It is best suited on festive occasions, Marriages and as Bridal wear and dance wear. This beautiful Palakka mala or necklace is traditional and Ethnic South Indian, Kerala Jewelry. Two Palakka attached both side of a Golden bead hanging round Palakka Pendant on Gold plated designer Chain. Stones fixed around the small pendant adds it's beauty. Although this necklace is traditional, still this is always in fashion. This traditional Green Leopard claw Necklace is Simple and ethnic South Indian, Kerala Jewellery. This Jewelry has been arranged beautifully withLeopard claw and magenta stones. Small round Pendant have golden bead hangings. Length can be adjusted with back link chain. It is best suited on festive occasions, Marriages and as Bridal wear and dance wear. This traditional mango Necklace is Simple and ethnic South Indian, Kerala Jewelry. This Jewelry has been arranged beautifully with Palakka and stones. This have small round pendant with Golden bead hangings. Length can be adjusted with back link chain. It is best suited on festive occasions, Marriages and as Bridal wear and dance wear. 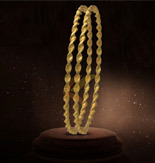 One Gram Gold plated Traditional Nagapadam necklace is very traditional Kerala, South indian Jewellery. This ethnic Necklace is adjustable with back link chain. Wear this on parties and marriages. It also worn by south Indian brides and classic dancers. This traditional One gram gold plated Palakka Necklace is Simple and ethnic South Indian, Kerala Jewellery. This Jewelry has been arranged beautifully with Palakka and stones. Small round Pendant have golden bead hangings. Length can be adjusted with back link chain. It is best suited on festive occasions, Marriages and as Bridal wear and dance wear. This beautiful Nagapadam mala or necklace is traditional and Ethnic South Indian, Kerala Jewelry. Nagapadam (Kobra Head) motifs attached to both side of a round Enamel Pendant on Gold plated designer Chain. Although this necklace is traditional, still this is always in fashion. Classic one gram gold Nagapadam Necklace is ethnic South Indian, Kerala Jewelry. This Jewellery has been arranged beautifully with Nagapadam and stones. Small round enamel pendant at center and stones fixed around and at the bottom, there are some golden bead hangings. It is best suited for festive occasions, Marriages and as Bridal wear.